Struck at the Royal Mint in London just over five decades ago, as Great Britain assisted Australia in the lead-up to decimalisation, the 1966 ‘Wavy Baseline’ 20c is one of the rarest decimal coins issued into circulation in Australia. Defined by – as the name suggests – a distinct undulation in the baseline of the ‘2’ in the denomination (refer the right image below), this key type is among the most famous of Australian decimal Varieties. The most momentous landmark in the history of Australian currency, the changeover to decimal currency was an enormous logistical task. Quite literally, millions and millions of new coins were required for distribution on ‘C-Day’ – ‘Currency Day’, February 14, 1966 – to replace the coins that had served the nation so well since 1910. 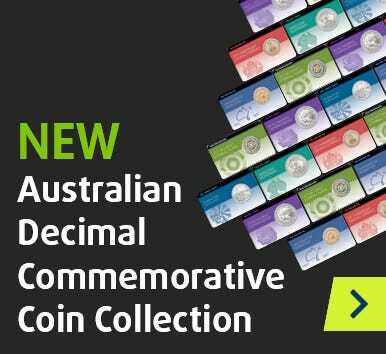 Such was the magnitude of the task, the Perth Mint and the Melbourne Mint were joined by Australia’s then new Royal Australian Mint – created specifically to facilitate the production of the nation’s new decimal currency. To guarantee that enough coins were ready to go, the Royal Mint in London was also recruited to help. Britain had played a key role in Australian currency production before, of course, striking all Australian coins from 1910 to 1915, as well as many of the coins for the George VI 1951 issue. Never before had the Royal Mint been required to strike such a huge amount of coins for circulation in Australia as it was asked to do in 1966. Whilst the Perth Mint and Melbourne Mint struck copper 1c and 2c coins, the Royal Mint in London was recruited to help the RAM strike the cupro-nickel 5c, 10c and 20c coins. Thirty million examples of each denomination were struck in London, and among the thirty million 20c coins would ultimately be found the 1966 ‘Wavy Baseline’ 20c type. Probably caused by a simple and slight variation in the production of some of the dies, the 1966 ‘Wavy Baseline’ 20c is distinguished by the obvious upward curve on the top of the baseline in the ‘2’. Not only very distinctive, the 1966 ‘Wavy Baseline’ 20c is extremely scarce. Although it is unknown exactly how many coins from the mintage are of this unique Australian Variety, there is no question that the 1966 ‘Wavy Baseline’ 20c is very scarce, regardless of the grade. A highly sought after Australian decimal variety, this coin fetches prices in excess of $4,000 on the rare occasions it is offered in Uncirculated condition. If you are interested in securing this important Australian coin type – or, indeed, any other decimal Variety or rarity – then by all means contact Downies. Some coins are rare, some are beautiful and some are historic. Some coins, such as the 1919-1921 Square Kookaburra Patterns, unite all three qualities. Genuine artefacts of one of the most fascinating chapters in the story of Australian numismatics, these important post-WWI Pattern issues today rank among Australia’s highest profile rarities. At the behest of the Commonwealth Government, the Melbourne Mint struck approximately 200 prototype kookaburra pennies and halfpennies over the course of 1919, 1920 and 1921. Whilst this project sprang from an initiative to find a lighter, more durable alternative to the bulky copper penny and halfpenny types inherited from Great Britain, the creation of the Kookaburra Square Patterns was also an expression of Australia’s developing national identity in the post WWI-era. Representing a potentially radical change to Australia’s circulating currency of the time, the 1919-21 Kookaburra Patterns were all square, and virtually all struck from cupro-nickel. Ahead of their time, the choice of this alloy pre-empted the use of cupro-nickel in Australian circulating currency by nearly 50 years. Australia’s first coins crafted from cupro-nickel would not be issued until the introduction of decimal currency in 1966. Of the total mintage of 200 Pattern coins, most were distributed to Government officials, dignitaries and VIPs for assessment. With a distinctive shape, and decidedly lighter than the incumbent coins – the Square Pennies, for example, weighed between 3.79g and 4.03g compared to the 9.45g copper penny – the concept seems to have been met with some approval. Indeed, it was announced in a range of newspapers in April 1920 that the launch of the new coinage was imminent. Unfortunately, the man behind the scheme, Treasurer William Watt, became entangled in a dispute with the notoriously difficult Billy Hughes, Nationalist Party leader and the then Prime Minister. Along with concerns about the use of the new coins in vending machines, it was the resignation of the Commonwealth Treasurer that ensured the demise of the Square Pattern project. The planned Square Kookaburra coinage was consigned to the pages of history – only for the rare Patterns to rise like a phoenix from the ashes to rank among the most valuable and heavily pursued pieces in the history of Australian coinage. If you are interested in securing one of the immensely rare 1919-1921 Kookaburra Square Patterns – or any other Australian rarity – then feel free to contact us.